Click here to see a full, high-resolution image of Mars comprised of about 1000 images taken by the Viking 1 orbiter in 1976. Image credit: NASA/JPL/USGS. More on the construction of this image can be found on the right. Mars is a cold and dry planet with a thin atmosphere of mainly CO2. The average surface temperature is -63°C and nighttime temperatures can be as low as -110°C. The atmospheric pressure at the surface is only approximately 7 hPa, which is less than 1% of the surface pressure on Earth. The Martian surface pressure varies a lot compared to the surface pressure on Earth. This variation is partly due to the high hills and deep valleys of Mars, and partly to the fact that part of the atmosphere condenses alternately on the north and south polar layered deposit as winter moves from the northern to the southern hemisphere and back. Both polar layered deposits consist of water ice and CO2 ice. In the summer most of the CO2 ice on the northern deposit sublimates leaving only the water ice behind. 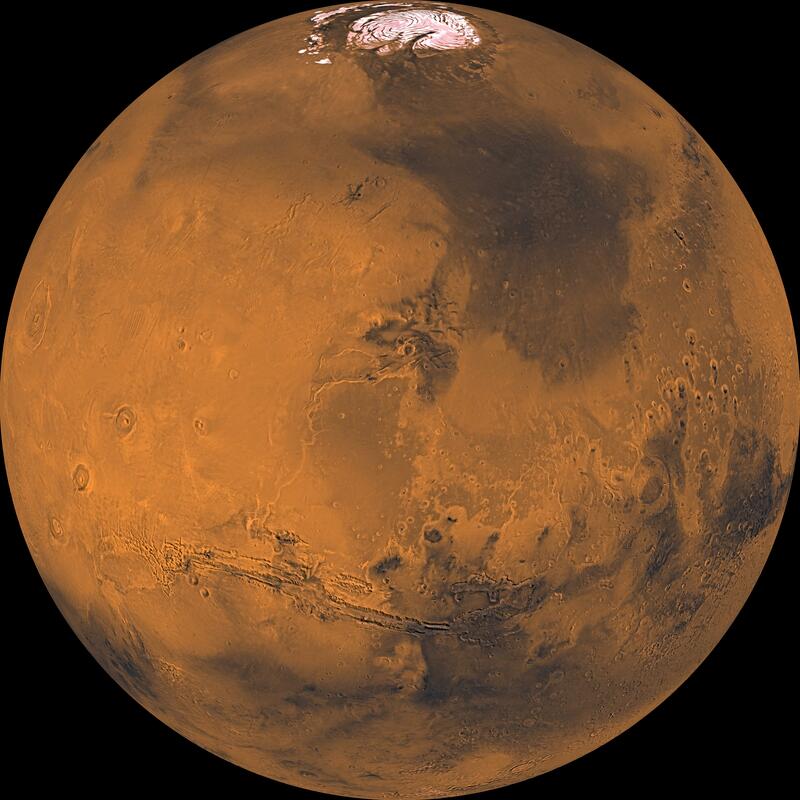 The atmospheric pressure on Mars is below the triple point of water, which means that at the surface water can only exist as ice or vapor, not as liquid. Since the Martian atmosphere is so thin, it does not prevent meteorites from reaching the surface, and since there is no major geological activity to erase impact craters, the Martian surface is heavily cratered. Several large, now extinct, volcanoes are also found on the surface of Mars along with the large canyon Valles Marineris. Mars lacks a protective ozone layer, which means that most of the UV-radiation from the Sun reaches the surface.